From the workshop: Don’t steal my Theme Options. Great writeup on theme options in Duet by Andy at the Theme Foundry. When you put this much thought and care into the settings of your product you are going to create a wonderful product. The same is true in any product. We need to get out of this idea that the act of spending time on a project means that you spent your time wisely. Sometimes you’re just wasting your time. What are your product’s goals? I’ve used Rdio for about a month now. Earlier I wrote how much I love the service. I still do, it’s tremendous. When Spotify launched in the US I figured I’d sign up for their premium account and give it a shot for a month. After a few weeks of using the service it’s clear that it’s not for me. I don’t like how Facebook determines the entire social graph. 1 I don’t like how it automatically crawled my iTunes library without my approval. 2 Mostly though I just didn’t like the service as much as Rdio. Silly me for thinking I’d find a nice “Cancel” link on that page. You have to go all the way to the bottom where you’re able to view your options for leaving. Okay, that’s not terrible. A bit obtuse of a UI, but I’ve seen worse. Alright, that’s just lame. I’m trying to end my paid subscription. I clearly already know what a premium subscription to Spotify offers because I already dealt with all the marketing copy when signing up. Bombarding me with the bullet points again seems desperate. There’s still no cancel link though. I guessed that it was the “Why do you want to leave?” bit all the way down at the bottom. 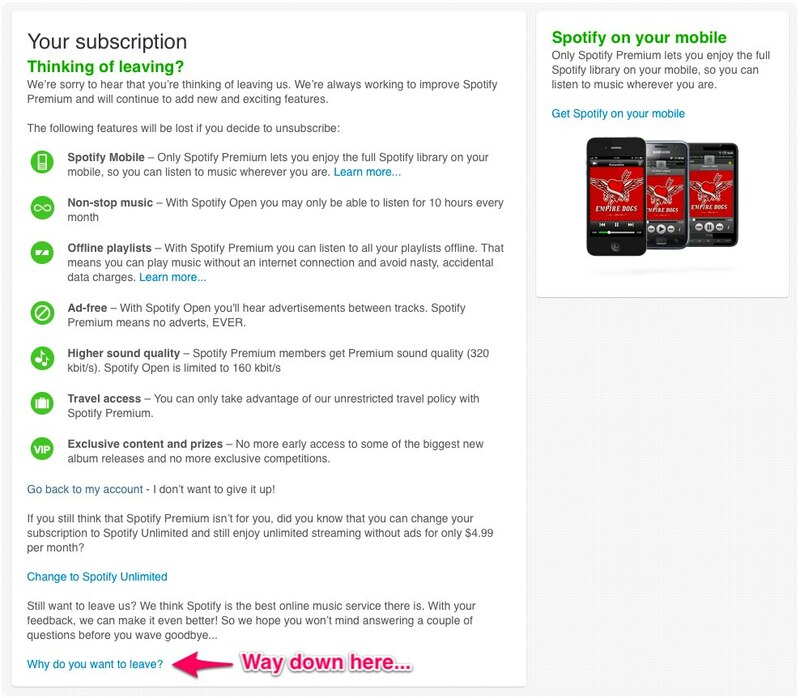 Turns out you have to go to this page where you then have options for telling Spotify why you are cancelling. In contrast, Rdio has a Subscriptions tab in my account settings. 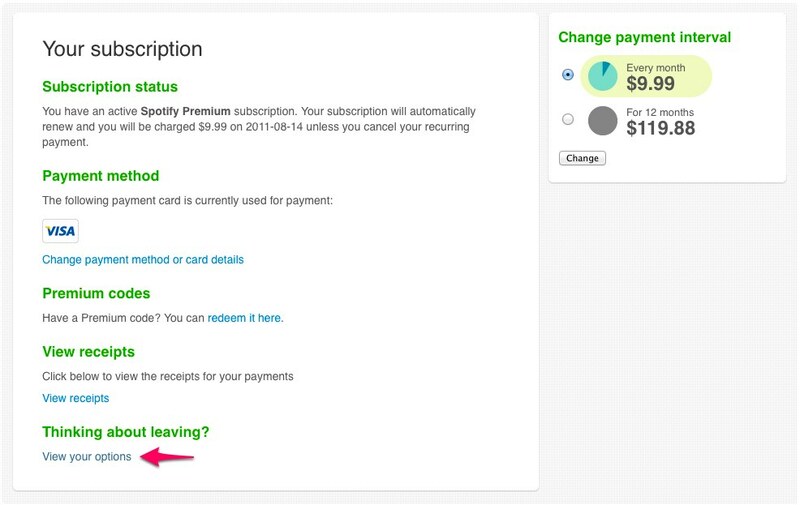 There, right at the bottom highlighted in red text is a button that reads “Cancel subscription.” Simple. Easy. Intuitive. 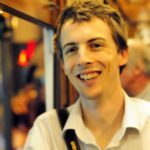 When paying for web services trust is a huge factor. It may seem counter intuitive, but the easier you make it for users to leave the more likely they are to stay. They’ll simply trust you more for being upfront with them. Rdio understands this. Spotify clearly does not. Don’t hide vital account functions like cancellation behind tongue in cheek questions like “Why do you want to leave?” I know why, just let me do it and get out of my way. The Guardian published an article a few days ago discussing the concerns of some academics over modern reading habits. It centers around the idea that, for some, reading online is an inherently shallower process that leaves a person less educated than reading traditional print texts. This misplaced concern does not account for the animated ads, commercial content, and constantly growing hodgepodge of buttons surrounding standard content online. Put this same interface garbage on a printed page and I would not be able to focus on a text either. For a traditional media outlet to decry the perils of reading online it ought to at least place blame in the right space. The Guardian, and other media outlets, that plaster ads and irrelevant content around their articles are not innocent bystanders to this loss of attention span. There are no tiny features when you’re doing things properly. This is why as a UX designer you need a good understanding of what it takes to implement a feature before you nod your head and write another bullet point.